« Call: Nothing Left to the Imagination? Is this a taste of the way touchscreens might evolve? The video [here] might just offer a taste of what mobile interfaces will become in the near future. 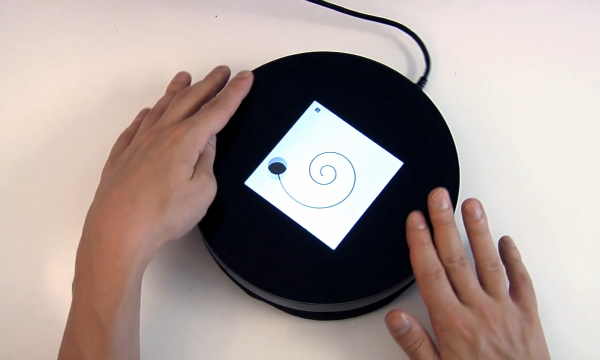 Tangible, designed by Georg Reil and Christoph Döring, is simply a device whose onscreen images change in response to tilting, pressure, and movement. Which sounds simple, but think about it: Touchscreens like the one on iPad might respond to tilting, but they do so in an effort to keep the image static. Tangible, by contrast, has images that actually dynamically change in response to the physical inputs you’re providing. Think of it as something akin to virtual reality or 3-D gestural gaming, without all the required hardware. The software only tools used to make it were Processing and Arduino. Granted, the interface so far is quite simple, and so are the onscreen displays. This is just a proof of concept. But the tantalizing idea is that of a more physically intuitive way of manipulating virtual objects — a way to return to the feel of manipulating things in space, rather than the sanitized, bloodless experience of using touchscreens. Still, there’s a subtle difficulty that this poses. Note how simple the iPad and iPhone interfaces are — tilting and touches are the only basic inputs on even the slickest games. By contrast, an interface that responds to touch, tilts, pressure, and rotation is a stepwise increase in complexity. The biggest dilemma in a piece of hardware like this isn’t simply creating it, but rather designing the software that makes it so all those inputs are so intuitive that even children can understand them without instruction. Add to that the problem of having an image that actually moves the entire time, and you’re dealing with a very thorny interaction-design problem indeed.